4 PC set that will make trimming your half square triangles, quilt pieces, or fabric cutting fabric applique easier quicker. 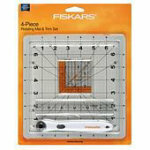 Set includes: One 8" x 8" Rotating Mat, One 18mm stick rotary cutter, one 2.5" x 2.5" ruler and one 1" x 6" ruler. Portable.